We are engaged in offering wide range of Silicone Rubber Braided Hoses at industry leading rates. 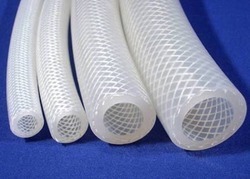 We produce a superior quality of Silicone Rubber Braided Hoses with excellent flexibility. It can be both stretched and compressed. Silicon can be gathered in a range of qualities resistant to temperature. It doesn't support bacterial growth. It is non reactive to body tissues and fluid and also non-adhesive to tissues. Looking for Silicone Rubber Braided Hoses ?